Over the last few decades, Agriculture Sector in India has made appreciable progress with its ample resources of water, land and sunshine. India produces all major crops for meeting the requirement of food, fiber, fodder, fuel and inputs for its agro industry. High Labor Scarcity and Government Subsidies are driving the Agricultural Mechanization. 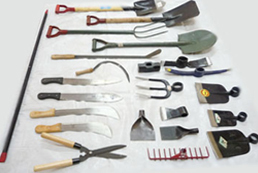 Farm equipment is one of the agriculture-allied sector which is booming all the time. There has been rapid growth in the Indian agricultural equipment market with expected strong potential for future growth as well. Asia-Pacific was the hot region where demand was more than twice in any other region. And in Asia-Pacific, India is one of the primary nations which have fuelled the growth of the agricultural equipment market. Power tillers, combine harvesters and rice transplanters, tractors are some of the farm implements for which a surge in demand has been observed during the past few years. Many factors affecting agricultural machinery sales in India include the monsoon, govt. declared support prices for crops, commodity prices, crop production expenses including fuel, fertilizer, pesticides and other costs and the credit policy announced by banks. The most awaited maiden budget presented by the Modi government shows sustaining level of growth of 4% in agriculture. The finance minister, Arun Jaitley has proposed a new scheme, ‘Pradhan Mantri Krishi Sichayee Yojana’, with an allocation of Rs 14,389 crore to expand irrigated area. Similarly, for expanding water availability in rain-fed areas, the budget has pushed the watershed programme with a new scheme ‘Neeranchal’ with an outlay of Rs 2,142 crore. And also the budget proposed to raise investment in agriculture. Agricultural credit has been increased to Rs 8 lac crore. A new scheme is proposed, ‘Long Term Rural Credit’, for purchasing the farming equipment. It would require investment over the long term and should help private investment boosting for higher agricultural growth. Who have the business know-how and financial resources to represent their products successfully. Distributors with strong people skills retail management experience are also wanted by the manufacturers. Previous experience in sales and a connection of the farm community can assist the distribution partner in building a successful business relation. Agricultural equipment distributors and dealers should be expected to sell to a diverse audience including, landscapers, weekend farmers, commercial farmers and general contractors. What about the investment and margins of a distributor? There are stronger margins in agri-implements industry and investment is as per the size of the industry. Small farming equipment machines required less amount of investment where as tractors and other big machines require at least a minimum of 5 lacs. Start plowing ahead in the global market. It’s worthwhile. Disclaimer :Images used in this post are for study and informational purpose only and these brands are owned by their respective owners. The images used in this blog posts are found from different sources all over the Internet, and are assumed to be in public domain and are displayed under the fair use principle. We provide information on the image’s source and author whenever possible, and we will link back to the owner’s website wherever applicable. If the original owner or owners of any image found on blog would like an image removed, please send us a message at helpdesk@getdistributors.com indicating this and the image will be completely removed.